The site is also a proposed Natural Heritage Area – Ardagullion/Cloonshannagh Bog (Site Code 2069). 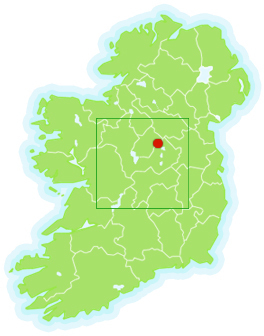 Ardagullion bog is a small midland raised bog site located in Co. Longford. The site comprises a core of uncut high bog which is surrounded by cutover and coniferous plantation. It has been estimated that there are approximately 56 hectares of high bog remaining within the site (Derwin et al., 2002). The vegetation of the intact bog surface tends to dominated by ling (Calluna vulgaris) and hare’s tail cottongrass (Eriophorum vaginatum) with species such as cross-leaved heath (Erica tetralix), bog rosemary (Andromeda polifolia), bog asphodel (Narthecium ossifragum), deer grass (Trichophorum cespitosum) and common cottongrass (Eriophorum angustifolium) also frequent. Sphagnum cover is high in the wetter, central areas however it is low along the drier, high bog margins. The lichen Cladonia portentosa is locally co-dominant, especially in drier areas which have not been recently burned. Approximately 25 hectares of conifer plantation lie within this site. This plantation is mostly less than 10 years old, however there is one small block of plantation which is approaching maturity. In recently planted areas there is already a modified bog flora present, dominated by ling with abundant low shrubs of downy birch (Betula pubescens) and gorse (Ulex europaeus) present (Conaghan and Heery, 2003). Some parts of these areas have had a long history of planting and it is likely that they will revert to wet bog woodland, probably dominated by downy birch (Betula pubescens) and willow (Salix spp. ), after restoration. Ardagullion bog is a small, but relatively intact, example of a raised bog habitat which supports significant areas of the Annex 1 habitats active raised bog, degraded raised bog (capable of regeneration) and vegetation of depressions (Rhynchosporion). It should be noted that active raised bog is listed as a priority habitat for conservation. The habitat assessment presented in the Natura 2000 form compiled for the site gives a global rating of B (good value) for active raised bog habitat. Raised bog habitats are now very rare in Europe and it has recently been estimated that the Republic of Ireland contains 50% of the relatively intact oceanic raised bog systems in Europe (O’ Connell, 1998). Raised bogs were once very common in Co. Longford however many of these were developed for milled peat over the last 50 years and now only a few isolated sites remain (Cross, 1990). Although substantial areas of conifers have been planted along the site margins, a significant area of open bog still exists and much of this still remains of high ecological interest.